The TP-410 is a high-performance distribution amplifier for computer graphics up to WUXGA or twisted pair video, unbalanced stereo or S/PDIF audio, and bi-directional RS-232 signals. 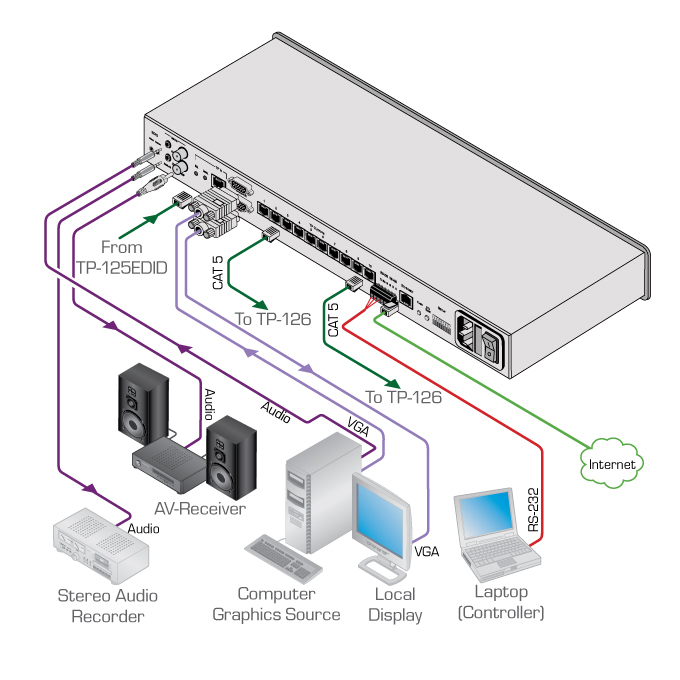 The RS-232 and selected audio/video inputs, distributed to ten twisted pair outputs. Resolution - Up to and including WUXGA (1920x1080). Selectable Inputs - Local or twisted pair (WUXGA, audio and RS-232). Data Handling - Extensive bidirectional RS-232 embedding, de-embedding and other options. Selectable Analog or Digital Audio Input. Transmission Range - Up to 300ft (100m) over STP cabling. Flexible Control Options - Front panel, RS-232, RS-485, Ethernet. Controls - Source selection buttons, power and source indicator LEDs, TP LEVEL and EQ trimmers.